Valerie: With great love in our hearts and with respect we are calling upon Cosmic Sai Baba to make his presence among us today. Today is Tuesday, 4th of April 2017. And we welcome Him. 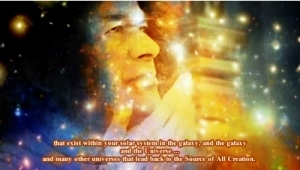 ❝“It is I Cosmic Sai Baba, and I am very pleased to be here. I have not much to say today – except I want you all to know that the Beings of Light from the Source of All Creation and those who you refer to as the Star People are all very happy with the way that the announcement has been received with regard to wanting to appear en-masse to the people, the Earthlings on your planet Earth. We are feeling it will be possible for us to show ourselves – when we promised – and so it is giving us great heart. For there are many problems upon this Earth that are among your earth people, that is in itself a warning for want of not understanding certain things and, er, and with yourselves introducing each other to the star people – the United Planetary Nations – you will find that it is like playing a game that when the game is played with a very good player your game is improved and it is a little like that. I hope I am not offending anybody by speaking as a game – that is far from it. It is a very serious matter living a life upon your planet Earth. However, there is a reason and a purpose for everything and the lives that you live in an Earth Body is but a short aspect of who you really are. A personality, actually. A personality who is able to think and use and store information in a brain that is called upon as you grow and as you work – but there is a consciousness from the Soul – and the Soul is always in filtering the brain. And I talk like this, because I would like you to understand that you can actually inter-act with both consciousness at the same time – and not overload the brain – but rather draw on information to momentarily lead you on to whatever you are doing and then it can be retracted back to the Soul Consciousness. So there is no problem, there are many things available to you – much knowledge, much understanding, much wisdom. And so as I have said – when I first came that I have not much to say to you today other than … … we will be coming en-masse to present ourselves to the Planet Earth. And we shall look forward to that indeed. We love you – we are your family – and so there is really no separation – even though the body that we all walk in different races – not just of Earth – but from other worlds, other planets, in your Universe. The consciousness is there – it can be limited but it can progress. And the feeling of Love and Compassion is what is existing in the Source of All Creation. And that is what you are My Dears – you are all from the Source and so you have in you that blessed feeling of Love and Compassion. Which can be shared with many. Thank you My Dears … …. Thank you.